Gala MontRoyale – Last call for tickets and support! We’ve pulled together a fantastically fun gala for May 7. It’s bound to be an incredible social but it’s about much more than that. 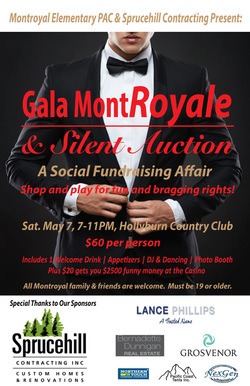 The purpose of Gala MontRoyale, May 7 at Hollyburn, is to enrich the education opportunities of every child at Montroyal Elementary. We aim to raise $20,000 to purchase a full classroom set of laptop computers. These are valuable and necessary tools for the students’ educational development, which are not funded by the school district or the Ministry of Education. We need the entire parent body’s support to make this happen. If you haven’t purchased your ticket, made a donation (why not throw in a bottle of wine!?! ), or volunteered to help out - this is your chance! Plus $20 gets you $2500 funny money at the Casino - play for fun and bragging rights! Watch for some exciting Silent Auction pre-bid opportunities this week! Need a sitter? Check your School Directory or click here. The Gala Committee is seeking volunteers to help out at the event. Shifts are no more than 1 hour long and include plenty of opportunity for socializing. Roles include guest list, 50/50 and raffle sales, silent auction duties and more. To sign up for your space, please email Tanis Fritz tanis@t2communications.ca or assign yourself a position here. Meanwhile be sure to check out the beautiful silent auction art projects on display in the school lobby, created by students in Divisions 6-12, with artistic guidance provided by Lorna Moffat and Susanna Li. Work will be on display until the Gala on May 7th. Photos of all the amazing art pieces can be found HERE. Agenda Order Forms to be returned to teachers by May 4th. School supplies can be ordered online at EduPac; all details are on the forms sent home with students. Ordering from Edupac is optional (some families prefer to shop for their school supplies). If this is your preferred method, please refer to the list on the Edupac form when purchasing supplies. All supply lists are on the Montroyal site too. Please check the tables in school lobby to reclaim any of your items. Photos HERE. If items are labelled it is much easier to send back to the rightful owner. Thank you. Is your child interested in the Montroyal Elementary's Red Cedar Book Club? The Red Cedar Book Awards are British Columbia's Young Readers Choice Awards, where kids in grades 4-7 vote for the winners! See more details HERE.